Beyond astronomy outreach, EAST was a stimulating opportunity to learn new ideas for expressing the beauty in the sky. This is my first concrete output from that. 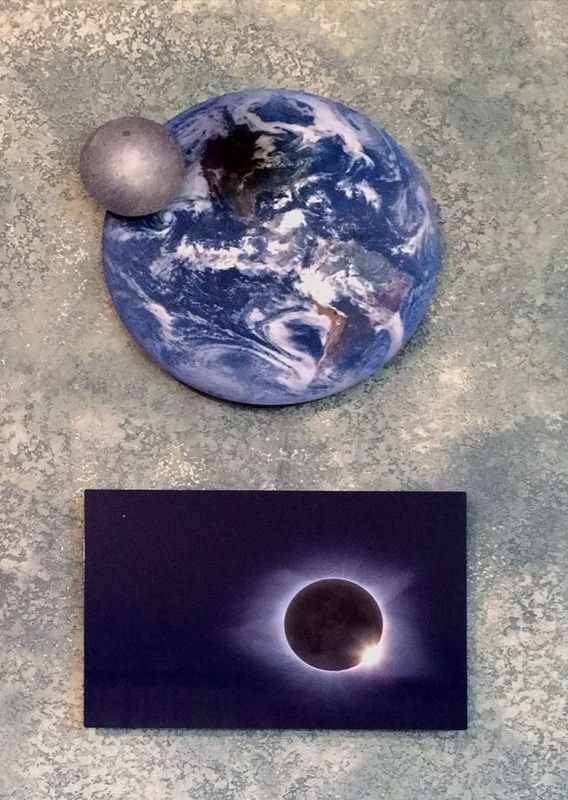 A 16x32", two and a half dimension, metal print photo montage showing space and ground views of the 2017 Great American Eclipse. I edited image data from the DSCOVR probe (lunar shadow on the earth, Deep Space Climate Observatory, Earth Polychrome Imaging Camera, credit NASA/EPIC Team), LRO satellite (far side of the Moon, Lunar Reconnaissance Orbiter, credit NASA/Goddard/Arizona State University), and my own images of the eclipse from the ground in Wyoming. I plan to live with this for a while and make sure I have everything just right. I have plans for a couple more of these 2.5D photo montages which will mix my own images with data from NASA space probes. This is a new visual communications vocabulary for me and I expect it to take some time to digest. Update: I believe that witnessing events like this eclipse has a spiritual as well as a literal dimension. Seeing celestial bodies moving in relation to one another can place us in a common context with them. This gives me an awareness of my place in the universe. What I'm thinking about doing with this piece is: adding a thin metal tube or rod arched gold floating frame around the piece. I think this "conceptual" frame will bind the human and universal literal points of view with a form that alludes to a spiritual shrine or cathedral window. I'm prone to over-thinking, but it may be a cool way to finish off this piece.